Finesse Fremantle is a Nauticat 44 Motorsailer built by the world renowned Siltala Yachts of Finland. 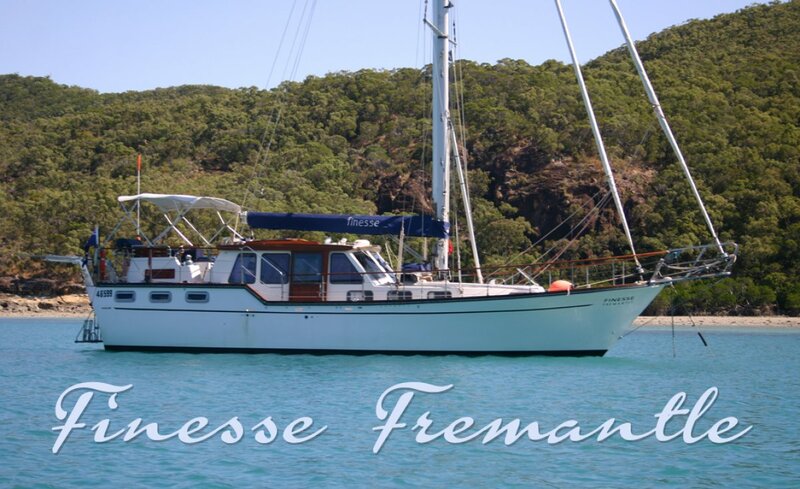 She is a genuine blue water cruiser, an extremely safe and comfortable vessel with many of the comforts of home. This "little Ship" has been well maintained and is ready for more adventures. There can be accommodation for up to 7 people. Aft can be found a double comfortable owners stateroom and separate shower and bathroom with its own electric head using a storage tank. At the bow there is a vee berth which can accommodate three persons (two on a lower level and one above). The galley table can also be lowered to create a comfortable and private double for occasional guests. The forward cabin and the galley areas share a separate bathroom complete with its own hot and cold shower and head. Both aft and forward cabins have lee cloths fitted. The wheelhouse has both port and starboard settees which can be extended and made into temporary sleeping locations, particularly for company to support the night-watch person. The galley has appropriate anchor points fitted to ensure safety at sea. The 4 burner stove with oven is gimballed and is adjacent to the double lid top freezer. The twin sinks (one full size and one half size) are next to the refrigerator. The galley table accommodates 6 people. This roomy pilot house has all controls, gauges and electronic equipment needed to operate the vessel safely. The insulated engine boxes offer a very quiet engine which is highly accessible for servicing when removed. The electronic chart plotter, radar and an A. I. S. Receiver will take you safely through the night. There is space for 6 others in the wheel house all comfortably seated with drop down tables one portside and one starboard side. The sound entertainment system can be used throughout the vessel and the TV-DVD can be viewed from the wheel house or the galley. The aft deck is a fantastic outdoor entertainment area with its own Bimini for shade and a separate rail mounted barbeque. A drop side table and comfortable seating for up to 6 people completes this outdoor dining area. The aft deck also has appropriate controls for operating her both under power and under sail. The two self-furling sails are operated from the safety of the aft deck whilst the main is raised and lowered at the mast using the easy in boom furling system. Jack stays are an integral part of the safety features with appropriate anchor points forward, aft and mid ships. Overall the boat is around 16 metres in length when you include the dingy on its davits and bowsprit. Five dorade boxes allow control of ventilation throughout the vessel and insect screens are fitted to all windows and doors. A water cooled air conditioner will deal with any tropical heat. There is more than adequate storage in cupboards and lockers throughout the vessel for even the most fastidious long distance sailor with spares. Aqua Pro 3.1 Sportmaster Inflatable RIB with folding anchor, oars and inboard fuel tank plus cover. Sleeps 4 in 2 doubles and 3 in single berths. Ample cupboard & Storage, Broadwater 4 x burner auto ignition gas stove with oven/grill (gimbaled). Sharp Carousel 240 V microwave plus Cookout Barbeque with separate 4.5 kg Stainless Steel gas bottle on aft deck entertainment area. Sedden 16.5 metres aluminium mast with fold down steps to the top, cutter rigged. Boom Master boom brake fitted. Extra Items: Clear View Screen & windscreen wipers, fitted insect screens throughout plus curtains throughout including front sunscreen, Various Boat Spares. Original manuals available for most equipment, various boat builders original drawings (not complete) plus operator's manuals. 20ft diameter Para Anchor "Pacific 20" with retrieval gear, Australian made, parachute anchor including 100 metre rode line and bridle assembly fully spliced with heavy duty stainless steel thimbles and shackles plus retrieval system complete with buoys also spliced with heavy duty s/s thimbles and shackles in brand new condition, never deployed.